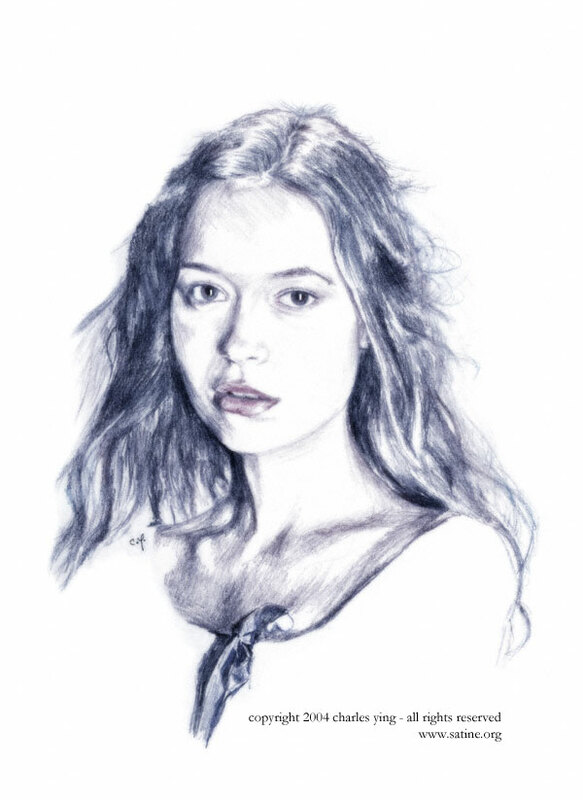 A simple drawing of the character River, from the television series, Firefly. River is quite a complex character; she’s crazy, she’s kind, but mostly, she’s fragile. Oh, and she has superpowers. The drawing’s composition is fairly straightforward, but the design it was used in ended up a little bit more interesting. In America is a movie about a family’s immigration to America, as told from the pov of their 11-year-old daughter. There’s one beautifully framed shot, in which the daughter gazes out the car window in awe at the wonders of the New World. Sarah Bolger plays the daughter, Christy. As it turns out, drawing kids is hard. I kept on changing and erasing features, eyes and cheeks didn’t line up and made her look a little cross-eyed, chubbier and skinnier at different times. It also didn’t help that this was a front view, vs a profile or 3/4. This drawing comes from my new sketchbook (it says Caslon paper, oooh, fancy). It’s a little bigger, which makes it easier to plan space, but I still have to get used to the texture, it’s not as easy to erase. In following from my previous art piece, this piece depicts a scene from the Buffy episode, “The Body”. Tara comforts Willow as she copes with the death of Buffy’s mother. The title comes from the idea that Willow is growing up as she faces the death of someone dear to her, as well as discovering a new love (first kiss) with Tara. If you haven’t seen the episode (or the series), I highly recommend it. The pencil drawing itself was done in my 7 x 5″ notepad. I took some liberties in coloring it with Photoshop, though I’m mixed on whether it looks better in sepia or in color. Ah well, I may change it later.